It was crowdsourcing old-school style — inviting ideas from community members whom you meet face-to-face. And I got to meet all kinds of people: small business owners, coal miners, local government officials, concerned citizens, environmentalists, clergy, students and young parents…people like Brianna Stallard, a recent graduate of UVA Wise who works at a local business that cleans polluted water from coal mines, and Bobby Bloomer, who recently opened a bike rental shop in Big Stone Gap and is tapping into the growing excitement around outdoor recreation and ecotourism in the area. It was inspiring to see the level of enthusiasm and optimism that people brought with them, and the high hopes they hold for our region’s future. In a few weeks, Appalachian Voices will publish an outline of all the ideas we heard, and early next year we’ll launch an online, wiki-type crowdsourcing project. The goal is to both broaden the reach of the effort and get more specific details about how to act on those ideas. Ultimately, we’ll synthesize the information into a “Citizens’ Roadmap for a New Economy” to help local governments, planning districts, and others garner federal and state funds for job training, infrastructure development, and other forward-looking economic development activities. The aim is to get more resources to Virginia’s coal counties for economic development. The eight community forums were formatted as highly participatory events, with small group discussions on specific questions about new opportunities for the region’s economy. At the end of each forum, the small groups shared their ideas with the entire crowd and everyone had a chance to vote on their favorite ideas. 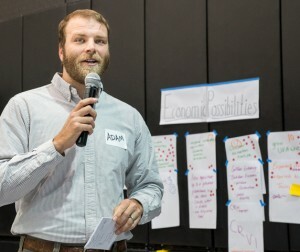 Common themes that surfaced included supporting advanced manufacturing and ecotourism, developing better relationships among local colleges and the surrounding communities, ensuring the area’s youth have a voice in helping shape the region’s future, and further developing the emerging industries of commercial drone and water-cleaning technologies. Forum participants also discussed the need to capitalize on existing broadband infrastructure and extend it to unserved areas. As an organizer, I was heartened to see so many new faces each night at the forums. The solid turnout and the diversity of the attendees speaks to how urgent the work of economic diversification in Central Appalachia is right now. During the forums, and in the weeks since, people have been pulling me aside and thanking me for the work we’re doing to help our communities move on from the days of the coal mono-economy. It feels great to join with our friends and partners in this broad community effort to move our economy forward. Publishing the summary of the forums in a few weeks and launching the online crowdsourcing project will keep the momentum going and stimulate more ideas from more people. The final report, or “Citizens’ Roadmap,” won’t just sit on a shelf. We’ll use it as an engagement tool to advocate for the forward thinking ideas that came out of the forums, and use the grassroots power that we’ve built over the process to make sure that the new economy we’re building in Southwest Virginia is one that’s truly good for people and the environment.